Unfortunately, some exhibitions such as Auschwitz. Not long ago. Not far away., are only temporary and limited to short stays in different cities. Together with the fact that, for some people, they are too far away, this means that not everyone has a chance to see the exhibition. However, technology is helping to overcome these limitations, with more and more exhibitions and national and international museums choosing to virtualise their collections. This means that anyone who is interested in visiting can first take a look from the comfort of their own home. Auschwitz. Not long ago. Not far away. has embraced this innovative trend and has created a digital version of the collection before the end of its time in Spain. 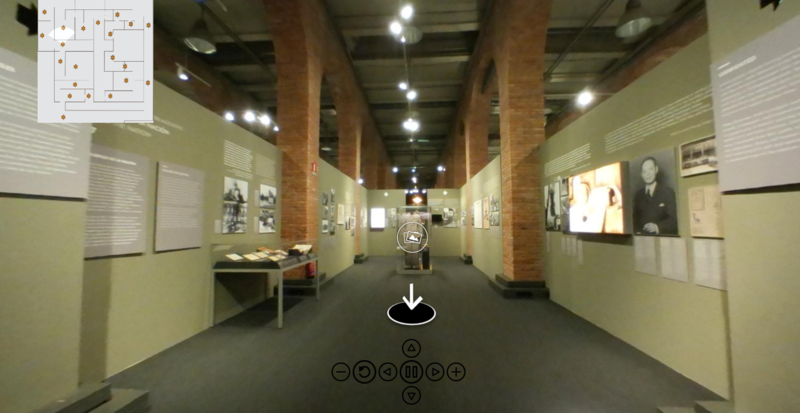 The result is a full virtual tour of the exhibition, with over 100 spherical photographs and 70 high-resolution images. Capturing the space in 3D format allows the exhibition to be extended indefinitely. In addition to virtual visits to the exhibition using a web browser, users can also choose a much more immersive experience using a virtual reality headset such as Google Cardboard or Oculus. To create this virtual version of the exhibition, it was necessary to keep the lights on after hours to reproduce it from the eyes of a regular visitor when the space was completely empty to avoid getting in the way. After taking the photographs, they were edited to ensure optimal quality and arranged in the correct order. To make the experience more natural for virtual visitors, they were then embedded with interactive components associated with high-resolution images to highlight some of the most interesting points. The project was directed by Dr. Óscar Costa Román at Universidad Francisco de Vitoria. Dr Román’s research interests include the virtualisation of artistic and cultural heritage and he has been using spherical images and virtual reality as a teaching resource for many years.